Medical Directives: Which Ones Do You Need? Signing medical directives can be especially important for people with special needs and their family members because it may be more difficult for them to communicate their treatment wishes to doctors. The terms medical directive, power of attorney, and end-of-life come up often, but which documents do you really need to sign? In Illinois, consider signing a health care power of attorney, a living will, a mental health treatment preference declaration, and a do-not-resuscitate order. A health care power of attorney allows another person to make medical decisions for you if you are unable to make them. The power of attorney can list specific instructions about your care that your agent (the person who acts for you) must follow, such as when you want life-sustaining treatment to stop and whether you object to certain treatments (as on religious grounds). Designating a back-up agent in case the first one cannot serve is a good idea. The power of attorney will remain effective until death, unless you change it in writing. Unlike a health care power of attorney, a living will tells your health care provider which treatment you approve only if you have a terminal medical condition. In Illinois, a condition is terminal if it is incurable and irreversible such that death is imminent, and the application of any death-delaying procedures would serve only to prolong the dying process. If withholding food and water would be the only cause of death, a health care provider may not withhold it unless the living will specifies otherwise. For people who sign both a living will and a health care power of attorney, your agent listed in the power of attorney will make decisions about terminal health care unless he is unavailable or unwilling. As a result, you should make sure that the two documents are consistent and reflect your wishes. A mental health treatment preference declaration allows you to state whether you want to be given psychotropic medicine, receive electroconvulsive shock therapy, or be admitted to a mental health treatment facility for up to 17 days if you are unable to make specific treatment decisions for yourself. The declaration format allows you to both write down your wishes and choose someone to make decisions for you. The person who makes decisions cannot be a healthcare provider or an employee of a healthcare facility, and he must accept the responsibility in writing. A declaration is effective until three years from the date of signing, and remains in effect if you are currently receiving mental health treatment (even if you try to revoke it at that time). To be valid, a declaration must be witnessed by two people who are not healthcare providers and who are not related to you. 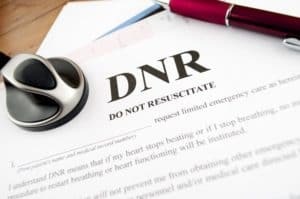 A do-not-resuscitate order tells health care providers not to use CPR (cardiopulmonary resuscitation) if your heart or your breathing stops. In the order, you can list other life-sustaining treatments that you want or do not want performed. For an order to be valid, you or your legal representative, your attending physician, and a witness must sign it. If you have none of the above documents signed, if they are not valid, or if they do not cover the medical situation at hand, the Illinois Health Care Surrogate Act determines who can make decisions for you. It is discussed in another blog post on our website. Finally, if you choose to become an organ donor, the only way to make this decisions binding is to register on the Secretary of State’s website.